Our server was prompt, and knowledgeable with both the menu and drink selection. C and I ordered drinks. He had a cider (Angry Orchard) and I had a glass of red wine. And we ordered friend green tomatoes as an appetizer. 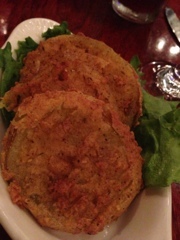 I LOVE fried green tomatoes, so I am always sure to try at a new venue. I was pleasantly that they were lightly breaded, and did not come out at all greasy. I was disappointed that they did not come with any sort of sauce. 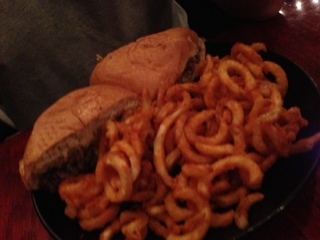 Chris ordered Philly type sandwich with spicy curly fries. He enjoyed his sandwich, said it was "delicious" , and his fries were just the right amount of spice. (I would of liked them a little spicier, but I love SPICY, so that that for what it is worth) I created my own pizza. 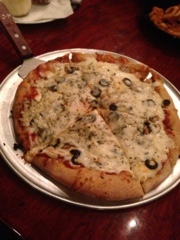 It has fresh olives, mushrooms and feta. It was a good size. In fact I ate half and took the other half home for lunch the next day. Overall we had a good experience and will be back to give it a try again. 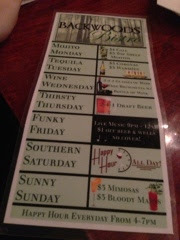 It has a varied menu, good prices, and we experienced good customer service. I would like to see them offer a lunch menu with smaller portions/prices. Thank you for taking the time to share your complimentary post. I am one of the owners- my son Jesse is the chef. As a relatively new family-run restaurant, we appreciate your comments and suggestions. Actually, we are bringing on a Lunch menu in a couple weeks. Have you been to our Sunday Brunch yet? Hope to see you again soon.